Today I downloaded and installed the new version (2.5). I only took Part 3 since I already had V2.4 installed. This is a known issue: If you have Windows 7, the game might crash to desktop while loading map. I had that also before the new update, but could connect after on or two tries. But now with version 2.5 I can't connect to an EOD-server (I only tried hslan-server), even if I try it several times. I did that when the maps "Caen" and "Last man standing" were running, but it always crashed to desktop while loading the map. My system: WIndows 7 Professional 64-bit --> I had compatibility mode activated (Win Xp SP 3 was standard, but with the new crashes now also tried XP SP 2 and Win9 and of course ran as an administrator. I guess I could try another server or reinstall everything, but maybe someone has an idea?! Cd Burner XP: was able to create an image, but if I mount the image on daemon tools, eod/bf 1942 won't start without a real cd in the drive, either..
Any ideas on these problems? Suggestions in English or also German, if you want. And big thanks already! Hm, I have absolutely no idea. Yould could try to reinstall EoD completely. 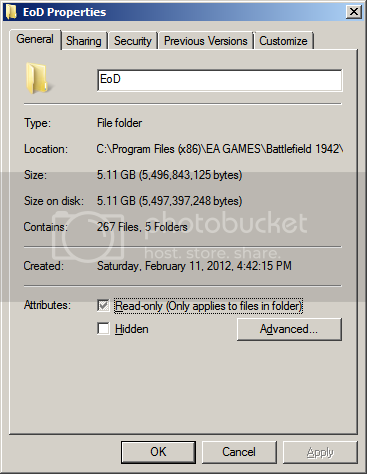 Check if there are any files older than 2012 in your EoD folder. If so something went wrong. Have you checked that you're really running v2.50?